This is a really enjoyable game that will keep you coming back for more! it will make you laugh and it will frustrate you to the point of throwing the controller across the room so be warned! Bomb Jack was released in the arcades in 1984 by Tehkan and a year or so later by Elite for a selection of home computers. The aim of the game is to guide Jack around the screen collecting all the red bombs to finish the level. There’s a bonus meter at the top of the screen with a flashing box around it, this box will expand the more bombs you collect, x5 being the max (arcade version). The commodore 64’s is at the bottom of the screen and the Spectrum version doesn’t have any bonus, just has an high score. Once you collect your first bomb, another will ignite, collecting these in order will make the game far more difficult but the bonus meter will increase even more. When the meter is full, the sound will change and a rotating ‘P’ will appear, spinning round the screen, if collected, any enemies on the screen at that time will turn into coins that can be collected for more points. This is when you turn into a joypad freak, blasting round the screen before the coins turn back! Other bonuses that can be collected throughout the game are a ‘B’ which will increase your bonus at the end of the level. A rotating ‘E’ will give you an extra life, and a ‘S’ (Special) awards a free game. The game’s antagonists are enemies that come in the form of mummies that will walk on the platforms and birds & sea crustaceans that will follow you around the screen. The mummies will drop down to lower platforms and eventually morph into flying saucers & orbs that will also float around the screen quite fast, if Jack is touched by these, he will lose a life! Believe me, you’ll lose many lives as the game goes on. Jack can be made to jump via the jump button but he can also be made to jump higher by pushing the directional control in conjunction with the jump button, pulling down will make him fall quickly. Whilst he is jumping highly, repeated pressing of the jump button will keep him up in the air, enabling a controlled decent, helping to collect the bombs a little easier. Bomb Jack 2 was eventually released by Elite & Encore in 1987 across various platforms, the less said about this version the better. In the game, Jack jumped around collecting treasure, armed with a stab key to defeat his foe’s. The game was pretty much a flop having no real comparison to the original. The C64 version of Bomb Jack II actually had the audacity of using the ThunderCats (1985) theme for one of its levels. Bomb Jack 3 soon followed in 1990 called Mighty Bomb Jack. The goal of the game is again to de-fuse the bombs and reach the exit door. Along the way you’ll encounter plenty of treasure chests, most of them unlockable by jumping up and down on top of them and most of them containing cash or power-ups for the hero. Taking place in what seems to be a labyrinthine pyramid, its more of an action/puzzler. The NES cartridge’s original instruction manual advised making a hand-drawn map as you played, it seemed to play more like Mario Bros to me. Here’s a list of the Baddies from Might Bomb Jack. n/a Mummy: Mummies spawn in the middle of the pyramid chambers whenever there are less than four enemies present on the screen. Any time a monster is scrolled off the screen, a mummy will appear on the ledge closest to Jack in order to replace it. After a mummy falls to the floor below, or has been walking around for a period of time, it will transform into one of the six monsters below. 0 Hanezo: These monsters have little regard for Jack’s position. They moves in one particular diagonal direction, and bounce off the walls at a 90° angle, continuing on until they bounce off the screen, or happen to run into Jack accidentally. 1 Geji Shogun: These overgrown insects will slowly track down Jack’s position. Jack can easily outrun them, but he must be careful if he ever doubles back in the same direction that he just came from, as this monster will surely be right there on his trail. 2 Gameido: This strange turtle like enemy uses Jack’s position and distance to determine its own direction and speed. When Gameido hits a wall, Gameido checks to see where Jack is, and how far away. Gameido begins to travel in Jacks direction, slowly if Jack was very close, and surprisingly fast if Jack was far away. Jack can’t stay in one place for too long if these things are on the screen. 3 Dokuron: These laughing skulls will bounce around the room until they manage to arrive above or beneath Jack. Then they will stop moving along their current path, and begin to home in on you. If you move away, they will resume bouncing around until they lock on to you again. 4 Desufa: Desufas are large fireballs that bounce up and down until they line up with Jack horizontally. They stop bouncing and begin to travel in a straight line to stay in Jack’s row, but they don’t turn around to catch Jack until they bounce off of a wall. 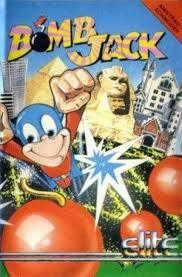 Bomb Jack was ported to various home computer systems from 1985 to 2009. 2014: PlayStation 4 (part of the Arcade Archives series), Wii U Virtual Console (NES version). Poke 49984,0 lives; 49530,x where x=number of lives. The game was pretty successful in the arcades and the Spectrum version of the game went to number 2 in the UK sales charts, behind Green Beret. All in all, I love this game despite the frustration of being killed so many times and it really is a true classic that will still be played years from now by many. I’m surprised that the ZX Spectrum version only ever made it to No. 2 in the UK sales charts behind Green Beret.